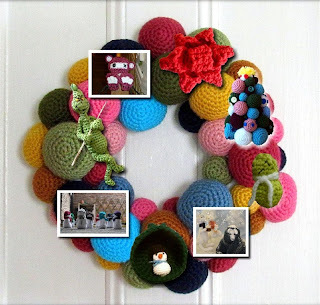 So this all came about because my friend Teeni, over at the Mad Crochet Lab, hosted a holiday collaborative project this year called the Virtual Handmade Holiday Craft Collaboration, where she helped us all create an amazing Virtual Holiday Wreath! Awesomesauce! I loved that while it was a holiday project, she specifically mentioned that this was a non-denominational wreath, and not to create any religious holiday ornaments. Not that I would have chosen a particularly Jesus-y project anyway, but it was fun to stretch my imagination to create something new that said "Holiday Spirit" without screaming "Christmas"!!! At first I considered 'winter-themed' projects, but crochet snowflakes boggle my brain. 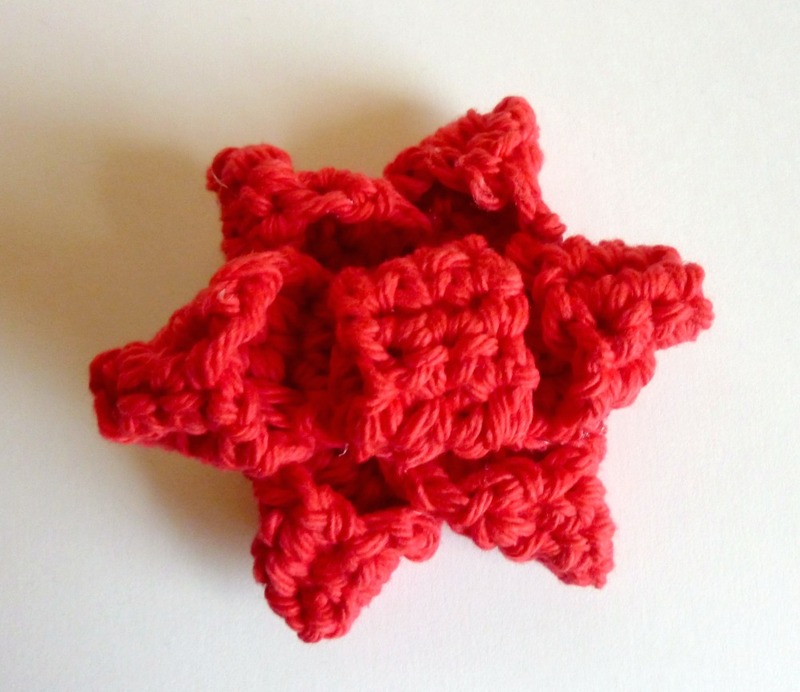 I put them in the doily category, beautiful thread, starchy and COMPLICATED. I wanted to make something easy and fun, and most of all, FAST! I just got my shipment of holiday wrapping paper from the fundraiser at Mimsey's school, so I've been thinking about getting started with the oodles of wrapping that I'm going to do over the next couple of weeks. That, of course, got me thinking about decorating the packages, and a really cute bow I saw on Pinterest that was made out of strips of paper cut from kid art. I had to try it in crochet! Like, right that minute!! And it worked! Yippee, it was a holiday miracle! I shot some pictures and sent them off to the Mad Crochet Lab! Then I started the process of fine-tuning the pattern to be able to write it out for you. I think I've make nearly a dozen, trying to figure out the best way to put them together. But I think I've finally got it, and I took a TON of pictures to help clarify the instructions. So, if you'd like to make a holiday bow (or ten!) read on! I used worsted weight yarn and an F hook for most of these bows, but it is completely adjustable to the size of whatever yarn you choose. 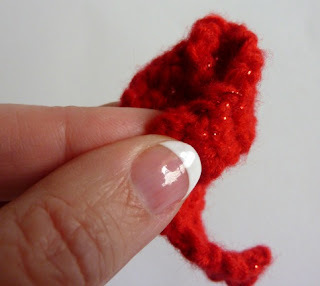 For a sport weight yarn use a D hook. For a Bulky yarn, I would try an I hook to start. 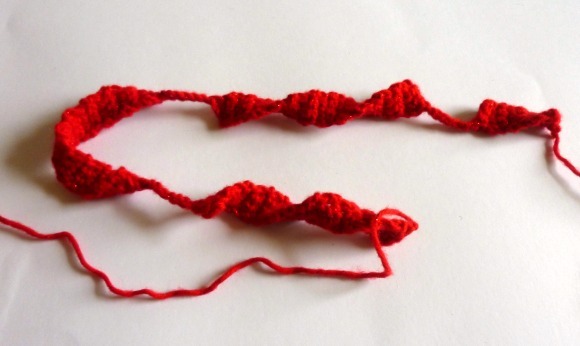 You pretty much can't screw this one up, but tighter stitches will look better than loose ones. The bow above was made with cotton yarn, but for the tutorial, I used Red Heart Shimmer in Red. 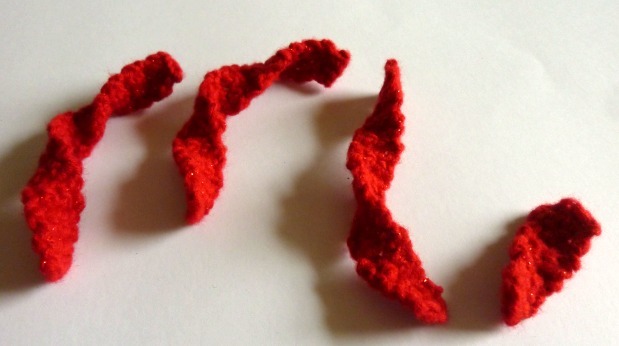 Kinda looks like crinkly bacon, huh? Start with one of the long pieces. See how it's twisting? We're going to use that to our advantage! Ooh, did you notice my fancy nails? Mims got fantastic grades on her very first report card, so we had a special Mommy/Daughter manicure day! I got the gel polish, so we'll see how long it lasts... It was AWESOME to leave with DRY nails, though! Now you're ready to start putting your bow together! Stack the strips on top of each other, little pockets UP. 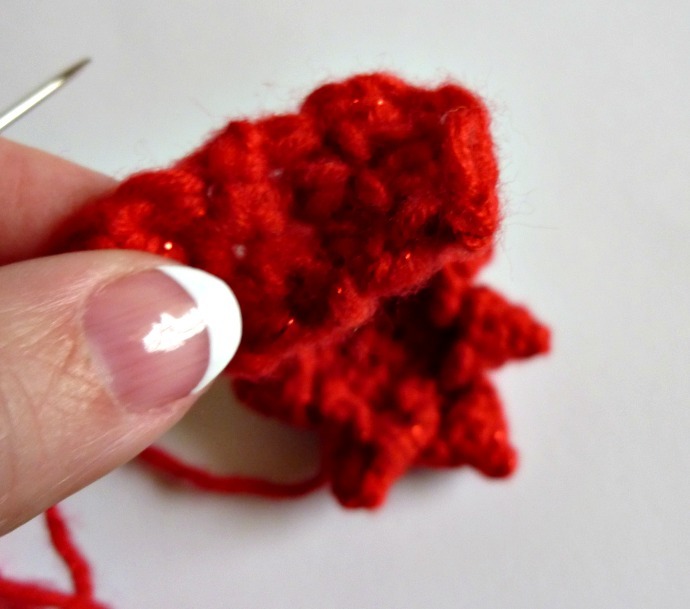 You may have to do a little fiddling with this part to find the combination that looks best. Now grab your center piece! Stitch it into place! Weave in any loose ends! Add a bobby pin on the back (or safety pin!) so that you can attach it to everything!! **Okay, so now that you know the 'right' way to make the Holiday Bow, I'm going to tell you the cheater way. 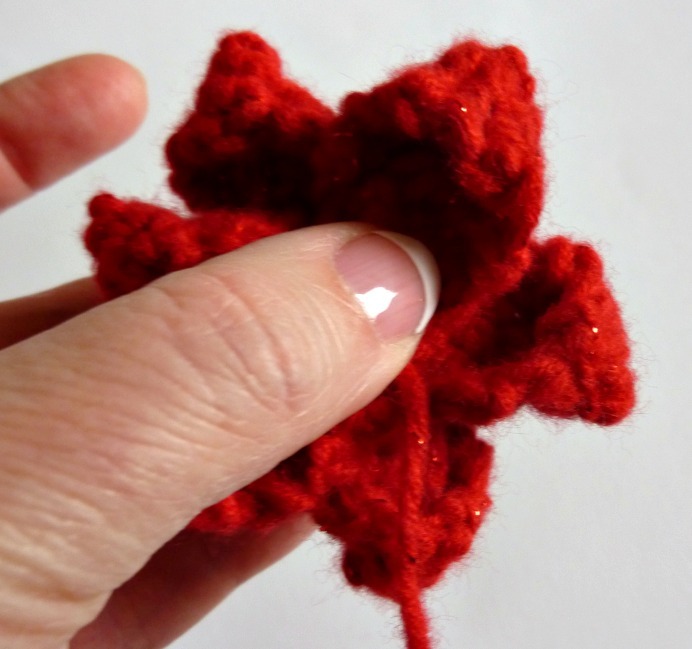 You don't actually have to stitch any of this if you use a hot glue gun. Just glue all the ends down, glue the long strips together, glue the little strip into the middle. You can crank them out in a couple of minutes! Why would you need more than one bow? Because you can use them for everything!!! -add a bow to a crochet hat (like my ebook exclusive, Prim's Hat)! 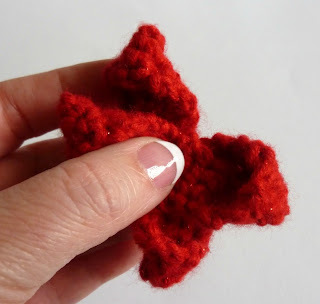 -wear a bow as a festive pin! 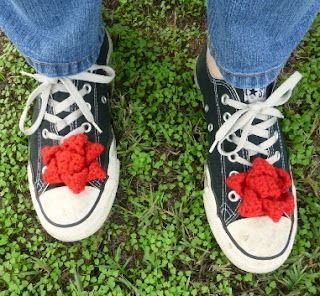 -attach a couple bows to the laces of your sneakers! -put a bow on the front of a soap dispenser cover! -sticky-tape a pair of bows onto your fake Costco Uggs! -hang bows from your artificial Christmas tree that your husband bought you the first year you guys were married! -use bows to top all of your gifts! I hope you have a ton of fun with this one! I know that I have!!! 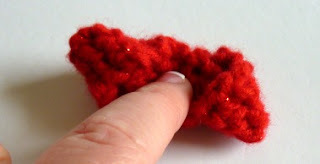 Update 12/10/12: Teeni, from Mad Crochet Lab, posted a video on how to make the bow loops. It's mind blowing! And she made a cute lariat using the bow as a focal point! I wrote about it HERE with all the links! If I get a break from snowflakes I am going to make a headband with one of these. So cute! You are an inspirational genius! I'm waist deep in crocheting elves but I'm willing to get neck deep just to try this pattern out! Hi Sue! I had a LOT of Dynamos asking about these, so I needed to share! Enjoy! Very clever, love the idea of taking something from another craft and converting it to crochet! Hi Pam! Me too! Thank you so much! Oh Jaime these are GREAT! Hi Renee! I think so too! Thanks so much! Hi Teeni! I hope it's easier! I think if you've made (or tried to make) the paper ones before, you'll pick it up so quickly you should be able to whip out a couple hundred by the end of the month! Glad you like it - I was a little worried! These are so cute! I've been following your blog for a while now, I was just stalking. Just joking, I'm a silent reader, I don't comment very much. The first try on one of these failed, my second was better but the finished product was all bulky. I think instead of cutting the strips I'm just going to make them seperately and hope for the best. So cute! Hi Kelsie! Um, it's going to be bulky. It's, like, 6 layers of crochet fabric... If you leave a space between the 'loops' in the center of each strip, it cuts down on some of the bulk, since now you're only having to fit 3 layers of thick fabric together. 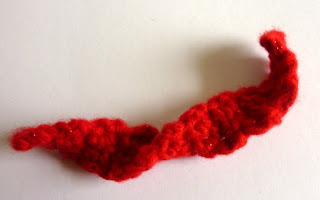 It is never going to look exactly like a thin ribbon bow. But, if you go away for a while, and then come back to it, it will suddenly look 'right' to your eyes, if you know what I mean. Also, a thinner worsted (like the Red Heart Sparkle) makes a thinner bow. So glad to finally meet you!!! Okay, my third is finished, and it came out WAY better than my first two attempts! After I got the feel of it the bow came along quickly, and since I just made the strips seperate(One strip of eight rows, three strips of twenty two rows) I didn't have to worry about weaving in a bunch of little ends! 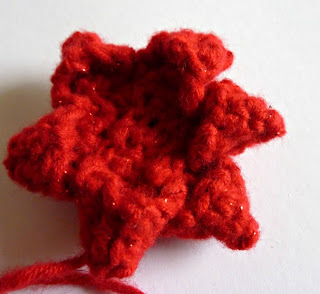 And just sewed the little points together with the ends also, so I didn't have to keep using a new string of yarn. And I cut down on the bulky problem too, I sewed the layers together really tight, making it not so bulky, and made the little points smaller so that there was a strip in the middle. After I got the hang of it, it's super easy! 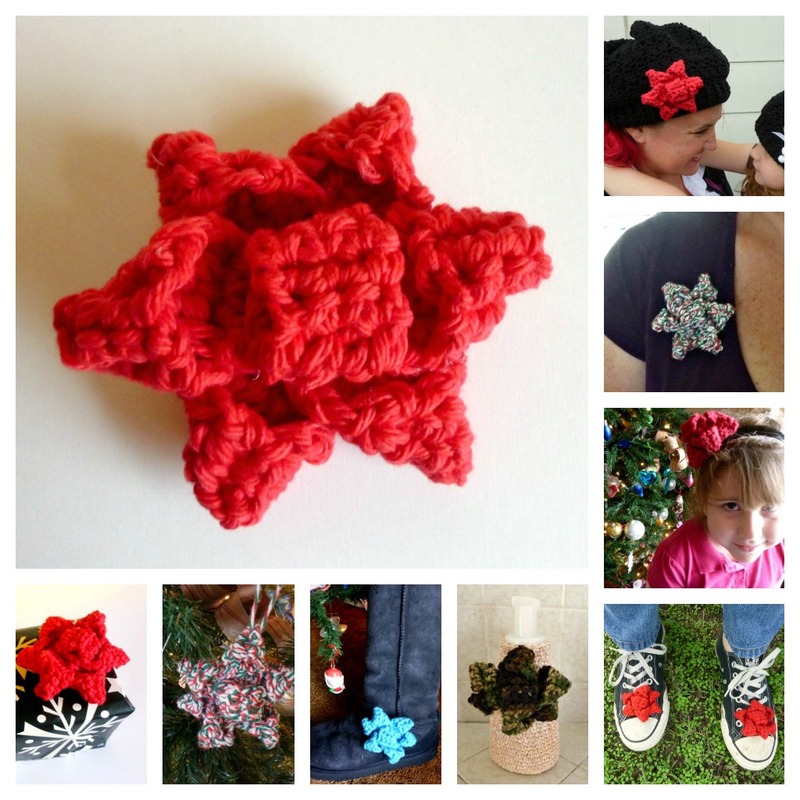 I love this blog, and your free patterns! Especially the wishing stars and the puffy wishing stars, and this! I turned mine into a cute hair clip, and I absolutely love it! 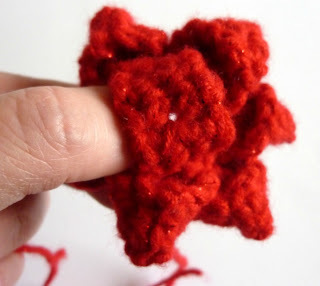 And every time I look at it, it looks more and more like one of those little store bought ones you put on presents. Except ours are way cooler, cause they're hand made and not all crinkly and stuff, lol. Anyway, please keep posting! Love this blog! Hi Kelsie! Oh, I'm so glad that it turned out good! I put one on a bobby pin for Mims and she wears it in front of her ponytail. Super cute!! And way better than old crinkly ribbon!! LOL!!! 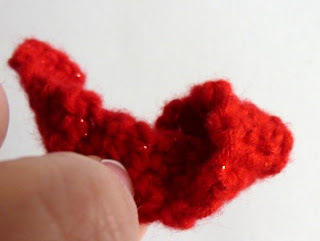 ok Mine came out bulky, maybe because I used red hearts. Hi Renee! I used Red Heart on the Camo version and the Turquoise version in my pictures above. It's going to be a little bulkier than you expect. But it will still look cute! cool, I made a blue one to go with Blue wrapping paper, I will send you a photo. OOh Renee! You are too clever! 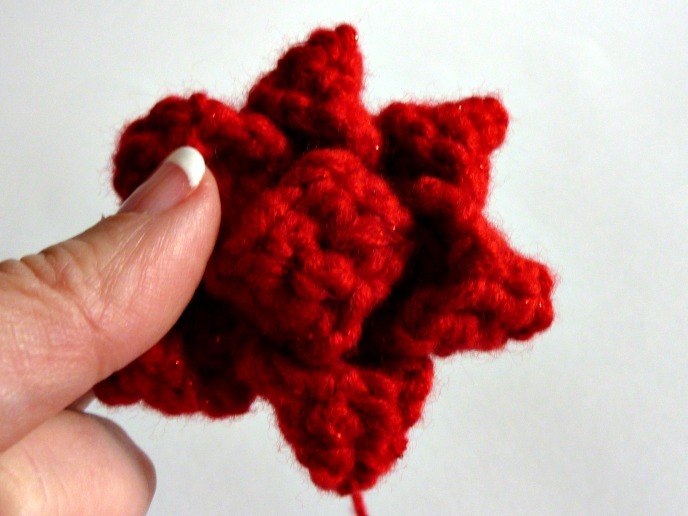 I think that this would be adorable in crochet thread! I'm going to have to get on that!! !